The Supreme Court on Wednesday allowed former Gorkha Janmukti Morcha (GJM) chief Bimal Gurung and the party's former General Secretary Roshan Giri a four-day window to approach the Calcutta High Court for protection and permission to campaign for the Bhartiya Janata Party (BJP) candidate for the Darjeeling Parliamentary seat. Till the matter is heard by the HC, the apex court directed no coercive action to be taken against the duo. Both Gurung and Giri absconded from Darjeeling after the West Bengal police sought their arrest in a murder case and accused them of engineering bomb blasts and violence in Darjeeling and Kalimpong in 2017 as part of their agenda to seek separate statehood for Gorkhaland. 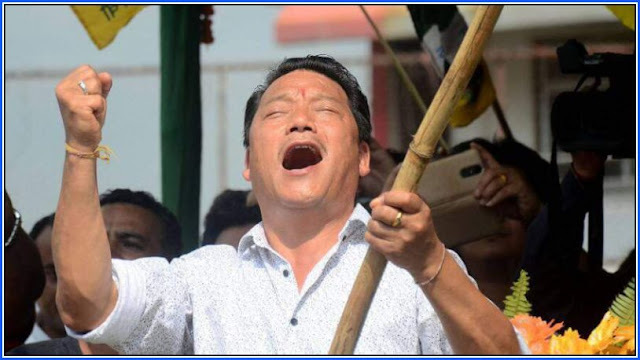 In their absence, the GJM was taken over by Gurung's former aide Binay Tamang who has sided with the ruling Trinamool Congress (TMC) government in the state. With the elections in Darjeeling slated on April 18, Gurung requested the apex court for protection to enter the state for campaigning during the elections. He feared arrest in the pending cases against him. Senior advocate Mukul Rohatgi appeared for Gurung and Giri and pointed out that the state government was out to ensure that the two persons do not enter the state before elections are over by framing cases against them. The state government, represented by senior advocate Kapil Sibal brought a CD containing telephonic conversation of Gurung to emphasize that he faces serious criminal charges and is an absconding accused who must be arrested. The bench of Justices Arun Mishra, Mohan M Shantanagouder and Navin Sinha directed the petitioners to approach the Calcutta HC seeking the same relief in the next four days. This would mean that the duo can enter the state and even campaign. The Court ordered the police not to arrest them till the HC takes up the matter. With the elections in Darjeeling slated on April 18, Bimal Gurung requested the apex court for protection. He wants permission to campaign as he fears arrest in the pending cases against him.